I cannot say when it was that I first became enamored with the idea of compiling a catalogue of the royal artifacts of the ancient world. As a bard and a traveler, I acquired many bits of lore and legend pertaining to these forgotten implements of power over the years, and finally realized that perhaps I should put this knowledge down in writing for posterity. So it is that I have taken quill in hand and embarked upon this history and codex of some of antiquity's most powerful and ill-remembered symbols of rule. In the following pages, you will find the histories, physical descriptions, and alleged powers of over 40 of the ancient world's royal artifacts. It is the author's most profound hope that the reader will take these entries - and the knowledge they impart - as treasure enough, and not as inspiration to seek out these items, some of which are cursed, and all of which are guarded by mystery and peril. However, being young once, himself, your humble narrator understands the allure of lost and mysterious treasure, and will satisfy his conscience with the knowledge that the intrepid adventurer will, at the least, be forewarned and thus fore-armed by the knowledge imparted in this document. 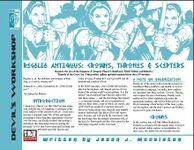 This 14-page PDF is easy-to-integrate and just the sort of thing needed for DMs to add depth to any great d20 fantasy campaign world and gaming session.